#Startup India, the most awaited event of the year happened on 16th Jan with lots of promises and a solid plan to execute it. Indian Prime Minister Mr. Modi addressed the event in the evening and as expected announced some of the major plans and action points to grow the startup culture in India. I am sure these action points by government will definitely help Indian entrepreneur to enter and grow their idea. So here are some of the major startup India action plans taken by Indian government to make India a leader in industry and grow startup and hence realize the dream of #MakeInIndia. Before going to PM Modi's major startup India action Plans, let me tell you the few most appreciating and encouraging lines from the #startup India event by Mr. Modi. • Start-up doesn't mean that a person is dealing with a billion dollar job employing 2,000 people. If one can employ five people he or she is contributing enough to the nation. • When we say Make in India we also say 'Make for India.' India is a great market. 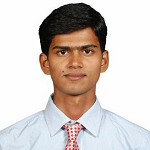 • India has million problems, but it also has billion minds. Definitely these were amazing lines to encourage the young Indians to start something new and help the problems that people are facing. 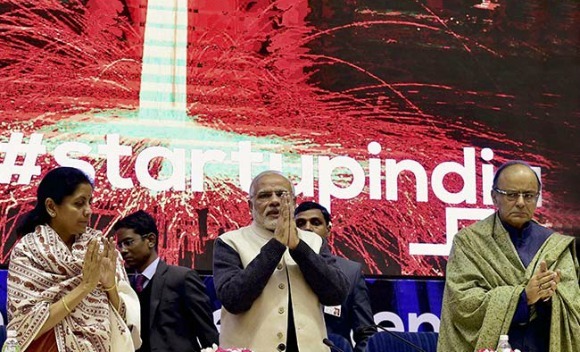 So here are some of the major startup India action plans by PM Mr. Modi. 1. Tax exemptions for three years and concessions on capital gains tax. 2. Compliance regime based on self-certification and no regulatory inspection for three years. 3. A fund of Rs. 10,000 crore to back startups. Initially the corpus will be Rs. 2,500 crore. Also, a credit guarantee fund for startups. 4. A Startup India hub - a single point of contact for interactions with the government. 5. Atal Innovation Mission (AIM) for promotion of research and development including 500 tinkering labs, 35 public-private sector incubators, 31 innovation centers at national institutes, 7 new research parks, 5 new bio-clusters. 6. 90 days for a startup to close down its business. 7. 80 per cent reduction in patent filing fee and fast-track mechanism for startup patent applications. Also, a panel of legal facilitators for startups to file IP (patents, designs, trademarks) with costs borne by government. 8. Relaxed norms of public-procurement for startups. No requirement of turnover or experience, but no relaxation in quality. 9. 5 lakh schools and 10 lakh students to be involved in core innovation programs. National and international startup festivals to provide visibility. 10. A mobile app to be launched on April 1 making it possible to register startups in one day. 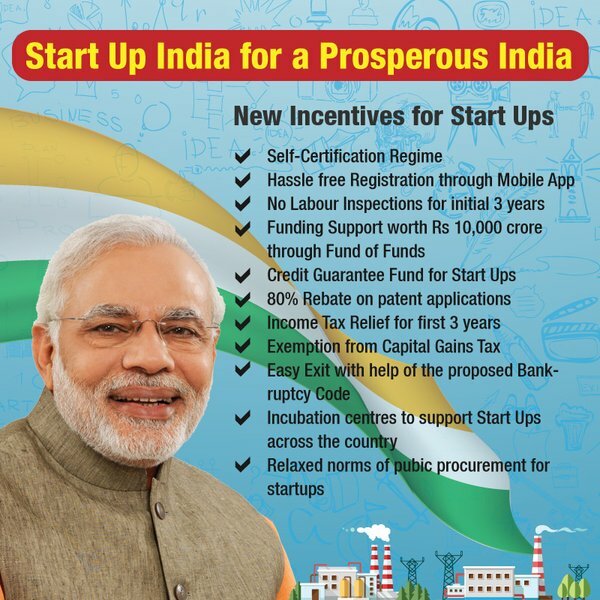 Here is the complete PDF file of startup India action plans by the government. If you are unable view the PDF, you can download from this link as well. These were few major startup India action plans. I am sure these initiative by Indian government will help the young generation to start their own venture and realize their dream. So what about you? What is your thought on this startup India event and the action plans taken by Government? Will these help the entrepreneurs to start their startups? Please share your thought with us. Please share this article to spread the initiative taken by government to help startup culture in India.